Bridgett “Bria” Crutchfield was baptized and raised in the Jehovah’s Witness faith, from which she was later disfellowshipped. 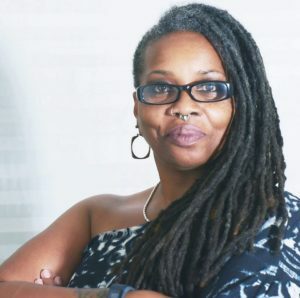 In 2006 she came out as an atheist, in 2011 she founded Minority Atheists of Michigan, and in 2013 she established the Detroit affiliate of Black Nonbelievers. In 2016 she spearheaded the initiative, Operation: Water For Flint via GoFundMe and raised $7k. Bria has 4 grandchildren, affectionately known as “Suga Babies” and is in a long term relationship with her partner, Kimberlee. She says she has a mouth as big as her heart, hates respectability politics, and will boldly tell you to kiss her where the sun doesn’t shine.